Aaahhh!! I've always daydreamed of going to somewhere tropical, sipping a drink, feeling the gentle sea breeze and listening to the sweet waves of the ocean. Oh, life. How I wish this is a daily thing. I wish I had stayed longer here at Louisiane Brewhouse and did sunbathing and swimming. But the time is limited so me and hubby enjoyed the place however we can. After hotel check-out, we decided to hang out at Louisiane Brewhouse before flying back to Ho Chi Minh City. We decided not to take the cab on our way to the brewhouse as we wanted to see more seaside views. Look at that beautiful golden sands! From the distance you will see VinPearl Island. The location of the brewhouse is never an issue since it can be easily recognized from the street. We've finally arrived! It was a super hot noonday sun but walking was just a breeze since the beautiful gentle winds from the sea offsets the heat coming from the sun. Strike a pose! Tired and exhausted we then make ourselves comfortable and ordered lunch. To know more about this look check out my previous post Monochromatic Striped Blazer X Denim Shorts. 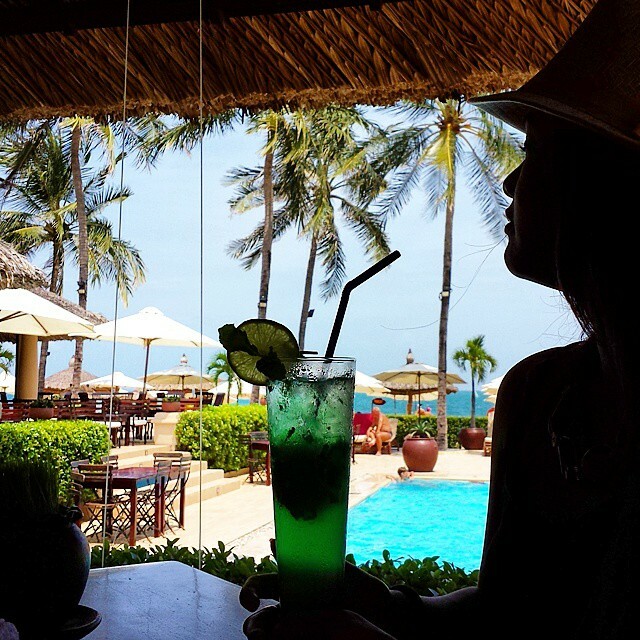 If you come and visit Nha Trang, I'd suggest you to visit this place as they serve the best. The seafood may come a bit pricey for some menu items as there are sold per kilogram i.e. crabs. The brewhouse owns their own brewery. So if beer is your thing then you will love this place. They also have their own beach and swimming area so kids will love this place too. To know more tips on where and what to eat when in Vietnam check out my post titled Vietnam's Glorious Feasts. I've mentioned from my previous post titled Vietnam Trip : Day 2 that we got ripped off by the taxi driver from Cam Ranh Airport to Nha Trang city center. Because of that, all our VNDs and SGDs got evaporated. My husband's credit card became useless for this trip because of the many erroneous transactions he made at the ATM the night before. However we only found this out when we were about to pay our bills at the brewhouse. I wish you could just see our faces when the cashier informed us that our credit card won't work. Hubby told me that I should be prepared to wash the dishes. Ahahaha! I was worried. I mean, come on, who wouldn't? Our last lifeline was our debit card and 'Praise the Lord!' it worked. Sigh! It was a relief. Thank goodness Vinasun Group of taxis accepts debit/credit card payment else we will be walking 30 km to the airport for our flight back to Ho Chi Minh City. Oh dear! Do check out my post : Vietnam Travel Itinerary for more travel tips and inspirations.